From my experience, sushi is one of those polarizing foods. You either love it, or you aren’t a fan of it. I’m one of those people who love it. It can be a great snack or a whole meal, especially paired with some stir fried vegetables. Unfortunately, unless you’re good at it and have a whole set up, making rolled sushi is very time consuming. 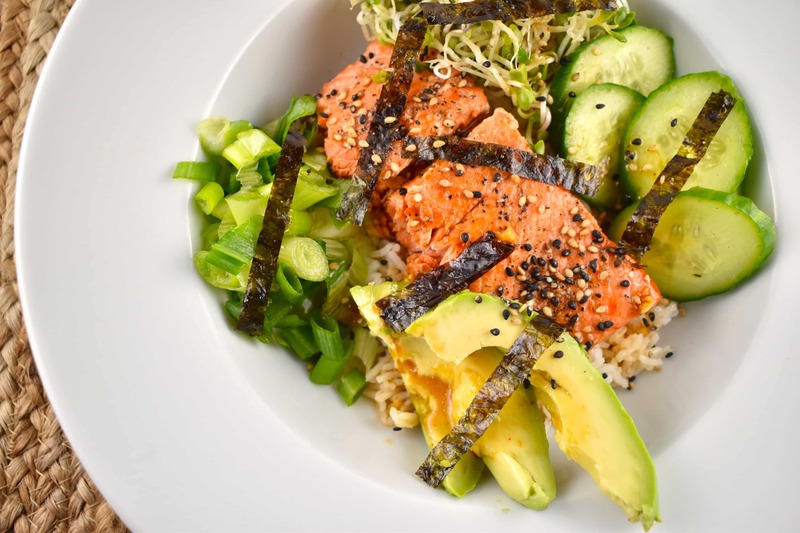 Enter this delicious, nutritious and simple Asian Salmon Rice Bowl. It’s a combination of sushi and the extremely popular “Buddha Bowls”. Buddha bowls have nothing to do with Buddha. In fact, they don’t have anything to do with religious beliefs at all. However, they are bowls that are filled with delicious and wholesome ingredients that are usually combined with a dressing or sauce to make the whole thing just amazingly good. These bowls have also been called “macro bowls” due to all the macronutrients (carbohydrates, fat and protein) that they contain. Just like the Buddha bowls, this Asian Salmon Rice Bowl is packed with flavor, wholesome ingredients and is so simple to put together. I used some of my favorite sushi ingredients – nori or seaweed, rice, salmon, cucumber and avocado – and combined them into a bowl. It’s as simple as that – no prepping the sushi and rolling it, just combine it and go. I love using salmon in this bowl. Salmon is an amazing source of protein. But it doesn’t just stop at protein. Salmon is also a great source of fat. But not just any fat. Salmon is high in a type of fat called unsaturated fatty acids. Specifically, it contains omega-3 fatty acids. These are great for your hair, skin and nails. But omega-3 fatty acids are also used in brain function and can also help to raise your HDL – the good cholesterol. The salmon is simply pan seared in a little cooking spray, so it’s quick and easy to make but it’s still tender and juicy. If you’d prefer to make this meal even faster to prepare, however, just cook your salmon beforehand. If you happen to be grilling a night or two before you want to have this Asian Salmon Rice Bowl, spritz the salmon with cooking oil and grill until just done. You can also bake or broil the salmon fillets. Then, just reheat the salmon (if desired) for a couple of minutes in the microwave or in a shallow pan with a little water. Feel free to pack this bowl with as many vegetables as you like. I keep it simple with a classic sushi flavor – sprouts, cucumber and avocado with the rice. However, you can get creative and add as many vegetables as you like. It’s a great way to add more fiber without increasing the Points. Whatever you do though, don’t skimp on the dressing! The crowning flavor of this whole bowl is the dressing. The simple dressing in I used is one of my personal favorites. It’s filled with the classic Asian flavors – soy sauce, rice vinegar, sesame oil and garlic. I recommend starting with slightly less honey and sriracha and then adding more to your taste. I love this bowl for a quick and easy supper, but it’s also a perfect lunch. It comes together so fast, and you can have everything ready to go ahead of time. Simply slice the avocado, pour on the dressing and enjoy! Whenever you have this – you’ll love the flavors of this sushi inspired Asian Salmon Rice Bowl. IF YOU LIKE THIS HEALTHY RECIPE, YOU’LL LOVE THESE! An easy and delicious dish that is so filling and flavorful, you’ll want to make it time and time again. Pan-seared salmon served over warm rice, and topped with a sweet, salty, and tangy vinaigrette, this salmon rice bowl is an amazing meal. Whisk together the ingredients for dressing and set aside. Heat a skillet over medium high heat and mist with cooking spray. Season salmon fillets with salt and pepper. Sear salmon about 3 minutes on each side, depending on thickness. Add 1/2 cup rice to 4 bowls. Top each bowl with cucumbers, sprouts, green onions and avocado.